Waterproof vinyl deck and membrane testing and certifications are the crucial elements for the continued success of Tufdek™ vinyl deck waterproofing and roof decking materials. We are continually subjecting our waterproof vinyl decking materials to extensive tests and independent audits to conform to the various national and international roofing standards throughout North America. See our specifications page for product drawings and details. The various testing and certification organizations listed below ensure every square foot of Tufdek waterproof vinyl decking complies with the industry’s highest standards. Who is Trinity/ERD? As one of the premier roofing and waterproof testing, certification and consulting organizations in North America, Trinity | ERD’s laboratory has provided independent testing services to manufacturers, consultants, architects, engineers, and contractors from around the world since 1995. Tufdek utilizes their accredited laboratory to perform various tests to ensure our waterproof decking and Tuff Shield roofing materials continue to meet code expectations, warranty standards, and numerous other aspects of building envelope integrity. Who is Intertek? Intertek is the world’s largest independent testing, inspection and certification partner. Intertek provides manufacturers and retailers with faster, more efficient market entry around the world. Their services include electrical safety testing, EMC testing, benchmark and performance testing, and turnkey certification management – all backed by a global network of product testing experts. Intertek provides the certifications and plant audits for all Tufdek vinyl waterproof decking products. These are supported by the latest technical research and expertise. CCMC evaluated products are used in commercial and residential buildings, roadways, bridges and buried services. Tufdek vinyl waterproof roof decking is listed with CCMC as an approved roofing material. Who is Atlas? For more than 100 years Atlas Weather Testing Solutions has provided customers with sophisticated technology and advanced testing solutions to determine how long their products will last. Who is QAI? QAI offers Accredited laboratories in USA and Canada for: Building Products EMC testing Electrical safety testing Fire testing And many other industries. Founded in 1994 by a group of experienced certification and testing experts, QAI is an independent third-party testing, inspection and certification organization which serves the building industry, government and individuals. For more information about Tufdek waterproof vinyl deck testing and certifications please contact our vinyl deck experts here at Tuff Industries. Contact us online. Or call our vinyl decking experts toll free at 1-877-860-9333. Each dealer and installation contractor is independently owned and operated. 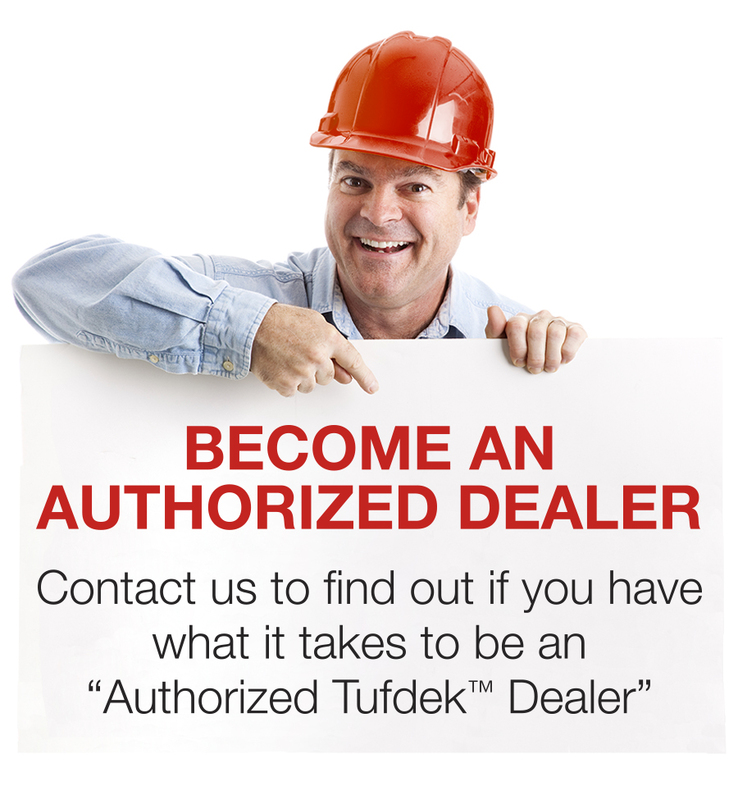 Each dealer is an authorized licensed user of the trade mark Tufdek™, which trade mark is owned by Tuff industries Inc. Dealers and installation contractors have no authority to assume or create any obligation whatsoever, expressed or implied, in the name of Tuff Industries Inc., nor to bind Tuff Industries Inc. in any manner whatsoever. Dealers and installation contractors are solely liable for all installation-related repairs and defects and related warranty work. Tuff industries Inc. strongly recommends that customers first conduct their own independent due diligence and investigations regarding the experience and qualifications of such dealers and installation contractors prior to retaining them.